It’s now been about a month since I got back from my time studying abroad, and I think it’s safe to say I am still utterly in mourning of the best time of my life. I was lucky enough to get to study my second semester of second year at the University of Western Ontario, in Canada. Studying at Southampton, and being from Portsmouth, I never felt like I had pushed myself to go too far from home, and this was definitely the opportunity to do that! The flight from Heathrow to Toronto felt like it flew by, and I was genuinely shocked at my lack of nerves in place of excitement once we were actually on the plane. The chance to set up life in a completely new country for several months was something I was so excited for, and the view of the the CN Tower, the Rogers Centre (home of the Toronto Bluejays), and frozen Lake Ontario only made landing in sub-zero temperatures that much better. I am very lucky, because any nerves that I did have were squashed by my friend Sam, who was also doing the semester abroad at Western and was there for me for the whole 4 months we were at Western, as well as the time we spent travelling after. Travelling with a friend is a huge comfort, however I would not rely on going with a friend. Don’t apply to study abroad only if a friend is going; studying abroad is about pushing yourself out of your comfort zone, meeting new people and embracing new experiences, so even if you are nervous, go for it. Easier said than done I know, but the friends that I made whilst studying at Western are friends that I know I will have for a very long time, and the people that you meet on exchange will be some of the best that you make during your university time! 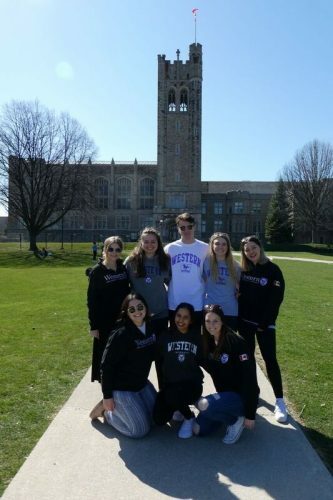 Western provided many orientation sessions as a way to ease the stress of settling in, and introduce new students to other exchange students. This is one of the main ways we met our friends that we did the majority of travelling with throughout our semester in London, Ontario. We managed to go on many trips to see lots of the beautiful places that Canada has to offer, including Montreal, Quebec City, Ottawa (Canada’s capital), Toronto, and even managed to nip into the states to spend a long weekend in Chicago! Each city offered something different to the other. Our weekend in Ottawa for example, brought me the experience of being the closest to frostbite I think I have ever been before in my life, as we stumbled across a winter festival that included an outside DJ (on frozen grass resulting on me slipping up at least twice), and the night time temperatures reached -18 degrees (!!!!!!). We also got to be a part of Canada’s coldest commute – each winter the Rideau Canal freezes, and the population of Ottawa use this as a new road, slinging their skates over their shoulder on the pavements and skating their kids in prams to preschool along the busy canal. Montreal is a foodie’s paradise, and Quebec City is one of the best locations to indulge in Canada’s very interesting history. Quebec City also presented us with the chance to go ice fishing! Which we did SUCCESSFULLY, and then enjoyed some of the tastiest trout ever. Finally, Toronto and Chicago, as such huge cities, offered everything and both were so amazing. 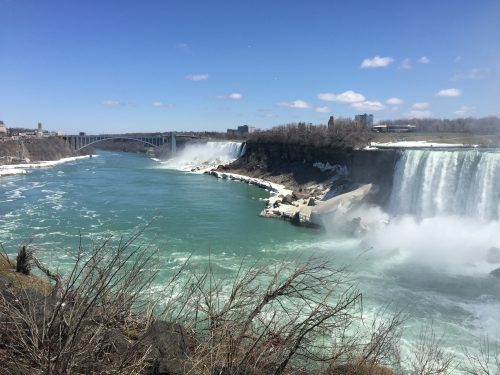 Toronto is Canada’s largest economic city, and as it is located so close to London, I was able to visit it several times, including a visit to the beautiful Niagara Falls, which literally can’t be captured in pictures it is so huge and beautiful and a very rightly named wonder of the world. Getting to visit Chicago was a highlight of mine, and although the American border is not the most relaxing place to be (! ), the trip was amazing start to finish and I think that my belly was full start to finish, mainly of deep dish Chicago pizza that looked like a pie. 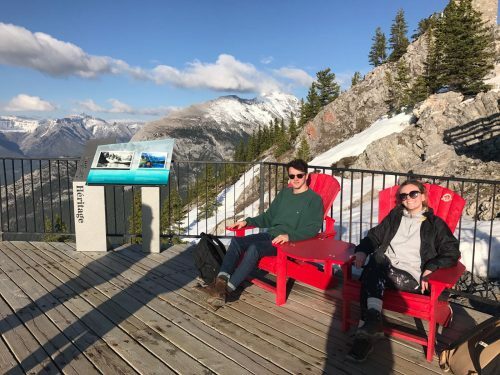 Getting the chance to visit these amazing places with such amazing people was so incredible, but what was also a huge part of my time in Canada was getting to experience a different style of learning as well. Canadian university is similar but at the same time so so different to the UK – for example, EVERYONE puts their hand up when the lecturer asks a question…or doesn’t ask a question. Everybody in the class is very involved, and this makes the lectures even more interesting. There are also so many different modules you can choose from that you would not be offered in the UK, ie Indigenous Environments. For a human geographer like me, this was exactly why I came on exchange; to get a new perspective on the subject I enjoy, and this module looked into the social issues that indigenous people of Canada, and the rest of the world, are faced with. 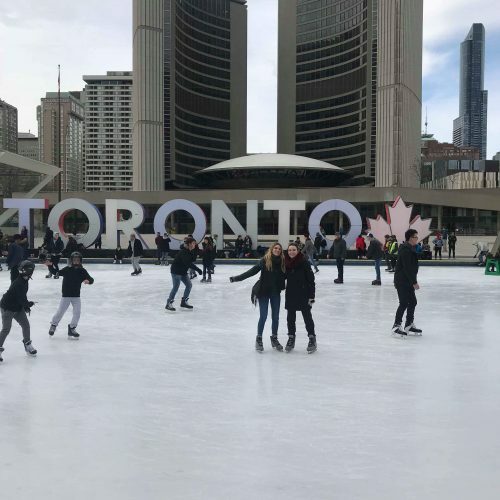 We absolutely indulged ourselves in Canadian culture, getting to see baseball and ice hockey games, throwing ourselves into St Patricks Day, and Traybogganing (sliding down a huge hill on a tray when everything is covered in snow), and it was the day to day life that was 100% as special and memorable as all of the trips. Sam and I really got into the University spirit of Western, and came home sporting official Mustangs merch. All of the students wore Mustangs merchandise all of the time and the uni shop sold literally everything you could ever need in the Western colour, purple. I am not trying to convince readers that there will be no down times or times that you are sad or homesick while you are away; it is easy to feel lonely in a foreign country with lots of new people, but I am very much trying to convince you that it is extremely likely that the good times will completely outweigh the bad times. 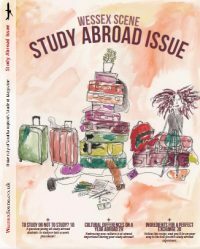 The most stressful aspect of going away to study abroad was not actually leaving, but the preparation to leave to study abroad. I found the stress of making sure that I would be able to keep myself going financially quite difficult, however there is support available from student finance and the university. I was also quite stressed by how early Western University were emailing about various administration procedures, including payments for bus passes and health insurance (both necessary and good value for money), as well as module selections. Even though I wasn’t leaving until January, I was having to organize these sorts of things during the summer holidays after first year. As well as this, if you’re wanting to save money it is best to book flights as early in advance as possible. What I am trying to say, is that all of the preparations can seem a lot and become quite overwhelming, especially if you are nervous anyway. I would urge people to not let this put them off! If there are people that are looking into doing their semester abroad though, I would advise them to not leave all of the above to the last minute! All of the boring admin stuff gets forgotten about once it’s done and out of the way, and then you just get to start buying swimming costumes or coats (whatever climate you’re heading off to), and start being excited about the amazing adventure you are about to set off on! Once we had gotten through all of our exams,we were able to start our travelling! Canada has SO much to offer and so much diversity across the huge landscape that makes up the country, and me and Sam wanted to see as much as possible. 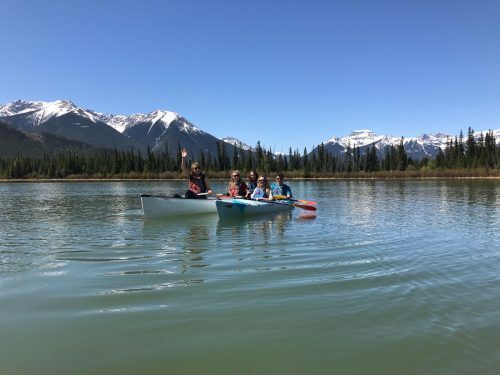 We made our way to Alberta, which is a central province that is home to the most famous national parks in Canada, including Banff and Jasper, and is also where the Rocky Mountains run through. This was the Canada everybody thinks about when you tell them that you’re going to Canada, or the ‘real Canada’, as the locals called it. We kayaked on the green lakes, saw black bears and their cubs wandering along the side of the road, and hiked more than I ever thought I would be able to after all of the pancakes and pizza I’d eaten over the last 4 months. After Alberta, we caught a 12 hour coach to Vancouver, which is one of the most exciting cities I’ve ever been to. Here, we saw killer whales in the wild, went stand up paddle boarding and camped on rainy Vancouver Island for 2 nights, and I had the time of my life. Canada is definitely one of my favourite places in the world, and I hope that I’ll be returning in the not so distant future!